The «Input Fields» page lists all existing input fields for your active document. Use input fields to allow users to input data that can then be used in document «Placeholders» to personalize the document purpose fit for the user’s needs, for example for selecting a Brand, a contact person or entering a subject line. Even things like switching between a color and black & white logo for the company brand can be accomplished by utilizing «Input Fields». To create a new «Input Field» just click on the «Plus» icon at the bottom of your lists of input fields. Then just click on the type of input field you wish to create. To edit an existing «Input Field» just click on the input field you want to edit in the list of input fields. To delete an existing «Input Field» just click on the input field you want to delete. Then click on the «Delete» button at the far bottom left of the input field edit page. You might have to scroll down to access the «Delete» button. The Wizard Add-In offers a variety of different input field types, each geared towards optimizing a specific type of data input. Each input field has some properties you can set individual. «Name», «Context/Group» and «Remember user’s last input» are common among all input field types. Additionally, when editing an input field you can use the arrow back (1) to return to the list of all your input fields. The Name of the input field will be visible to the User in the «Wizard» Add-In. Please try to choose a short and meaningful name like Author, Contact, Subject, Classification, Log, Signee etc. The Context/Group will be visible to the User above the Name field in the «Wizard» Add-In. The user can collapse and expand groups in the «Wizard» Add-In using the collapse/expand icon to the left of the group name. 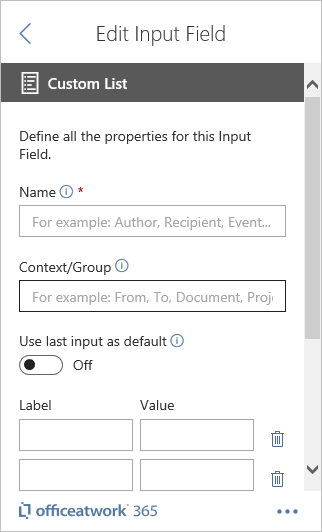 Try to pick logical group names that can be shared among multiple input fields providing the user with a logical understanding of all your input fields. Group names could be something like From, To, Document, etc. If set to «On» the «Document » Add-In will remember the user’s last input and automatically apply the user’s last input/selection for that field the first time the «Wizard» Add-In runs for each specific document. This will only work for «Input Fields» that have the same «Name», «Context/Group» and are of the same type. Enable this option to automatically populate the «Input Field» with the currently signed in user. The «Personal Contacts» type allows you to let the user select personal contact in the «Wizard» Add-In. The list of contacts comes from Office 365 Outlook and represents the users contacts in Outlook. Please note that «Personal Contacts» does not support Outlook Shared Contact Folders. 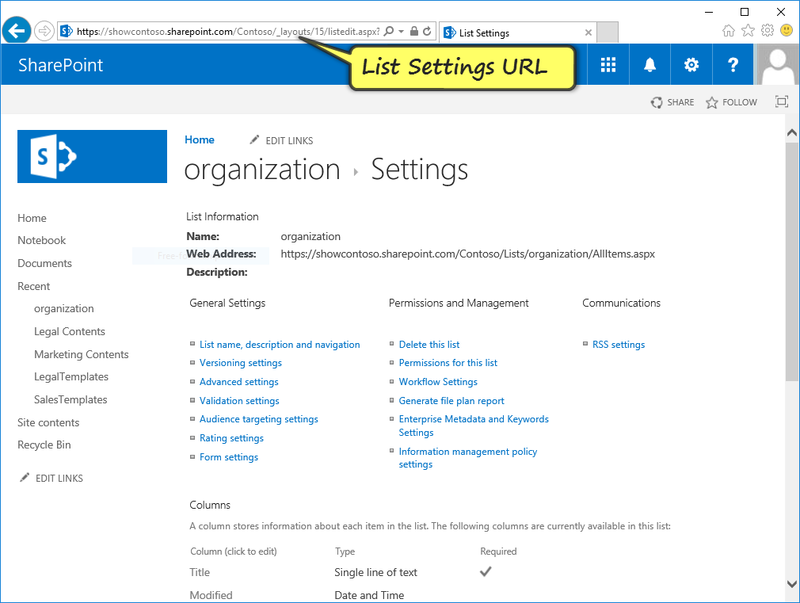 The List Settings URL is used to identify the SharePoint list. It is easiest to copy and paste the List Settings URL from your browser when viewing the list settings page of your SharePoint list in your browser. After you have exited the field the Add-in will check if it can access the library referenced in the URL. If successful it will enable and populate the Search Field and Description Field below with values. Please be aware that the URL must be within your SharePoint online root host. 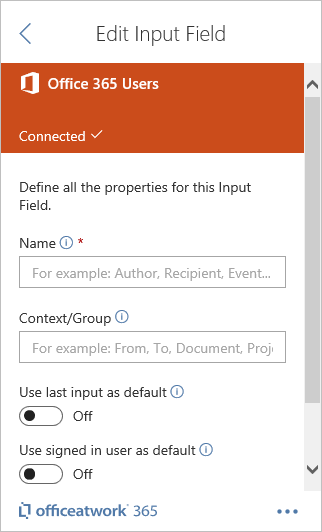 The «Search Field» is the field used in the «Wizard» Add-In to search and select an item from the linked SharePoint list. 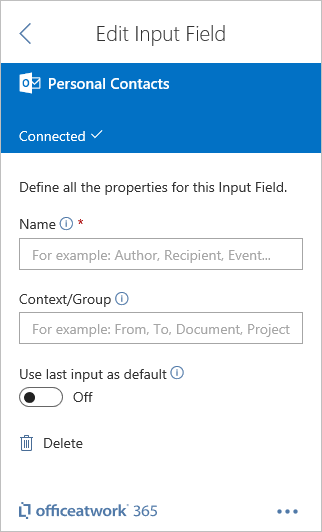 Most commonly this would be the ‘Title’ field from your SharePoint Online list. The «Description Field» is the field used in the «Wizard» Add-In to help the user make the right selection. Its content is displayed together with the content of the Search field helping the user to select the desired item from the linked SharePoint online list. 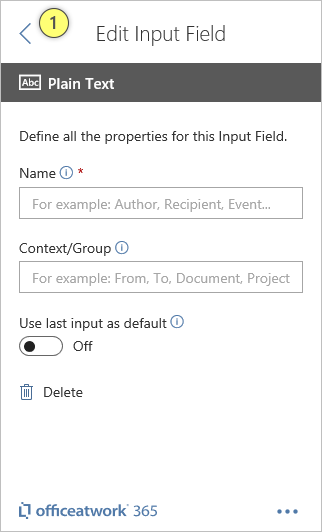 The ‘Default Value’ option will allow you to select a specific Item (record) from your SharePoint list selected by default. For this to work you need to specify some criteria that will find a record in the SharePoint online list. The criteria is defined by a field using the «Field» dropdown, an operator using the «Operator» dropdown and a value entered in the «Value» field. Note that the value can be made up of static input as well as formulas using Nunjucks functions. To add a function just click on the «Insert» button below the Value field. 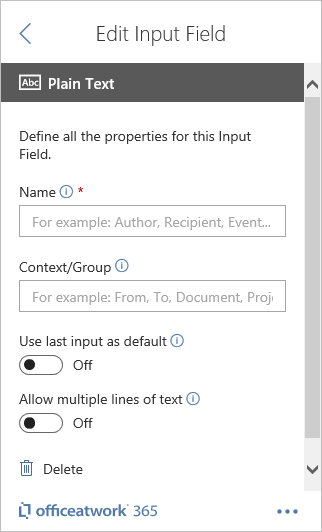 The first item is found in the SharePoint list that will return true when comparing field with the value using the chosen operator. 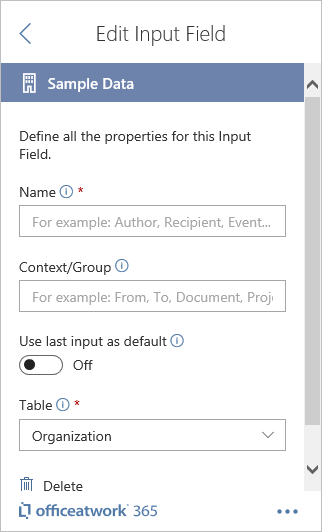 Example: select the first SharePoint record where the SharePoint column ‘City’ («Field») ‘Starts with’ («Operator») ‘London’ («Value»). Use this input field type whenever you want the user to be able to input some text of any kind without any guidance. This input field type has no additional properties. If set to «On» the Plain Text Input field in the «Wizard» Add-In will offer the user multiple lines for entering data instead of just one line. The «Custom List» input field allows you to let the user make a choice between pre-defined options in the «Wizard» Add-in. A typical use for the «Custom List» would be to control if the company logo shall appear in color or black & white. Each option in a custom list has a «Label» and «Value» entry. The «Label» will be visible to the user as the option he or she can pick. The «Value» will not be visible to the user but can still be used within a calculation of a placeholder value. To create new entries just press the plus icon at the bottom of the list of all custom list items. To delete an item, click the delete button to the far right of each custom list item. There is no limit in how many items you can have in a custom list. We do though suggest to not go crazy regarding the amount of items per custom list. Preferably a custom list has no more than 7 items. Once all Custom List items have been created one of the entries can be defined as the default item. This means that this item will automatically be selected as the default value when the Custom List field gets displayed in the «Wizard» Add-in. 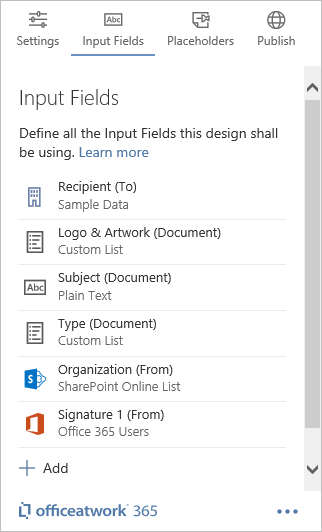 The «Sample Data Picker» type offers a fast way to learn how users can select data using the Wizard Add-In without having to first set-up lists and libraries in SharePoint. All our sample files that we offer for the «Designer» Add-In and «Wizard» are using input fields of «Sample Data Picker». The «Sample Data Picker» offers different types of sample data. Use the Table field to select the type of sample data you want to use in your input field. 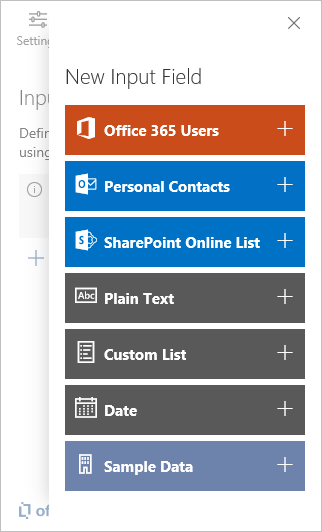 Some fields like the «Office 365 Users» or «SharePoint Online List» field are connected to an external data source. 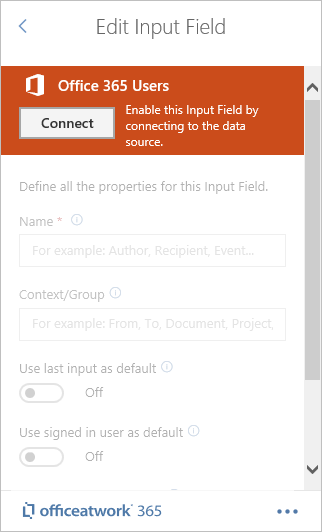 Sources you have not recently used will present a «Connect» button enabling you to allow the «Designer» Add-In to connect to the corresponding data source. 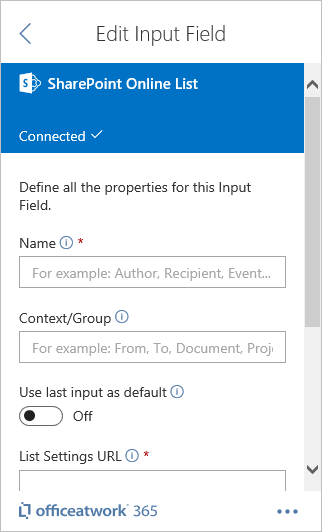 In this case you first need to click the «Connect» button and go through an authentication flow to be able to edit the properties for that input field.